Delphin Technology has now extended its flexible Expert Logger range with the new Expert Logger 300 which can easily handle any multi-channel requirement. Featuring 46 universal channels, the new 300 series dataloggers are ideal for a wide range of applications including temperature measurement and monitoring across multiple channels, industrial plant and machinery optimization, cleanroom monitoring, product testing, remote monitoring of machinery, and more. Equipped with a full communications suite including WLAN and UMTS/LTE option and USB, along with professional ProfiSignal analysis software, the Expert Logger performs high-speed, high-precision measurements. CAS DataLoggers supplies these bestselling systems—give us a call at (800) 956-4437. Data logging applications in laboratory and industrial environments often require processing of a large number of analog inputs. Inside the Expert Logger 300’s compact design, all inputs are differential and galvanically-isolated to protect against interference from sensor circuits while also preventing earth loops. Analog measurements are made at a high-precision 24-bit resolution with fast sampling rates of up to 50 measurements per second. Each universal input can be individually-configured for Thermocouple, mVolt, mA, Pt100(0), Resistance, or DMS sensors. Users can measure resistances of up to 100 KOhm directly along with Pt100(0) sensors using both 4- and 3-wire technology. The compact Expert Logger requires only 210 mm of rail space, making for easy installation into existing switch cabinets. This provides you with a multi-channel, complete system requiring minimal space, while detachable terminal connectors simplify assembly and wiring. Expert Logger systems have an internal data storage of up to 14 GB (approx. 420 million measurement values), making them ideal for autonomous measurement and monitoring tasks. For data security, the internal storage capability can also serve as a backup for PC-based measurement systems. Measurement data can be stored fully automatically via FTP upload to an external storage medium such as a NAS drive, network server or internet cloud. In applications without network support, data can be easily transferred from the Logger`s internal storage using a USB stick or USB HD. 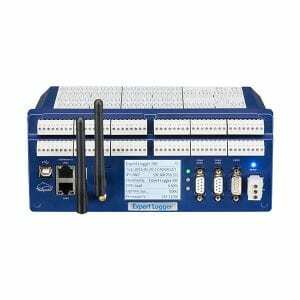 A WLAN and UMTS/LTE option is also available for the Expert Logger 300. Expert Logger devices include Delphin ProfiSignal Go software for in-depth analysis of data. ProfiSignal Go displays both current and historical measurement data in state-of-the art trend diagrams. Users can also zoom from annual to millisecond levels and analyze data in high resolution, regardless of the volume of measurement involved. ProfiSignal software is Office-compatible with data exportable in ASCII format to Excel, or vector-based graphics inserted into Word documents.